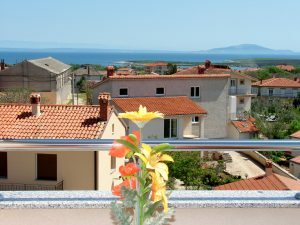 Apartment Lana is located in the center of Lisignano and allows you the perfect vacation, whether in the form of an active holiday in the area or relax on the balcony with a beautiful view on Medulin archipelago, Premanturu, Rt Kamenjak Losinj and Cres. The taxpayer is not in the VAT system. 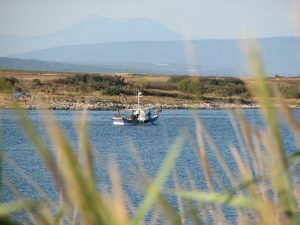 At the southeast end of Istria lies fishing and agricultural village Lisignano. Lisignano's coast counts as much as 28 kilometers a truly beautiful and intact beaches which stretches Mediterranean vegetation making a marvelous blend of personal pleasure and the Mediterranean. The history of many fascinating archaeological sites of old over 7000 years old sunken ships that are still in the waters Ližnjana, amphorae and Roman villas. Nearby there is Medulin (2 km) and as a tourist center provides all kinds of entertainment, and of course, Pula (11 km) to enjoy the historic architecture and the benefits of a larger city. Be sure to visit Cape Kamenjak, the wonder of natural architecture, only 20 minutes driving from Lisignano. If you are comming by car from western or northern Europe take the highway A9 from Kastel to Pula, after the last exit of the highway (MEDULIN) continue straight to the second roundabout and take the third exit to Liznjan-Lisignano. If you are comming from eastern Europe take the highway from Zagreb to Rijeka and then to Pazin and Pula. A mandatory law - General Data Protection Regulation (GDPR) requires every guest have to present valid government ID upon check-in, persons other than registered guests are restricted from the apartment. As of 25.05.2018. we are obliged to inform you that when placing a reservation and at check-in into your place of accommodation you agree to present your personal identification documents, i.e. submit your personal data. first and last name, type and number of your personal identification document, gender, state and address of residence, with date of birth and citizenship.